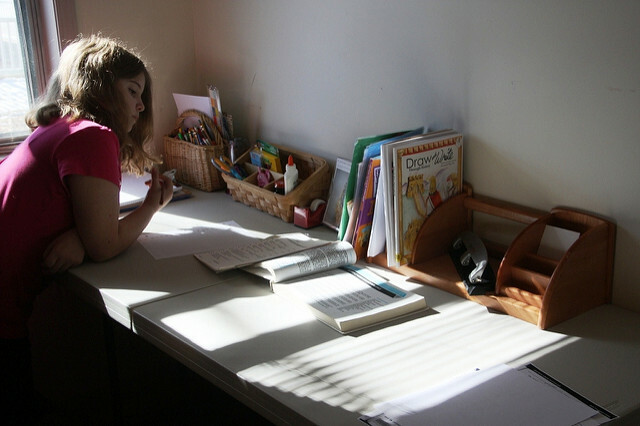 The number of families who choose to homeschool their children has steadily risen since the late 1990’s, and the Internet may have something to do with it. Online resources and connectivity provide unprecedented support to deliver a quality education at home. This gives more parents the support and confidence to take charge of their children’s learning. According to the National Center for Education Statistics (NCES) the percentage of homeschooled children nearly doubled from 1.7% in 1999 to 3.3% in 2017. This increase also marks a growing diversity in the homeschooling population, and includes more kids who are gifted or have special needs. When Janie Gwinup’s daughter daughter Elizabeth was diagnosed as profoundly gifted (PG), the family explored homeschooling as an option. “She was already way above of her age level in academics, and we wanted to plant our family values and religious faith in her at home. We also wanted to tailor her path to fit to her educational, emotional, and social needs,” said Gwinup. But keeping the active mind of an exceptionally intelligent child stimulated is a demanding task for a parent-teacher. That’s why the availability of online resources factored largely in the Gwinup’s decision. “Having internet access played a significant part into our decision to homeschool her,” said Gwinup. “We live in a small city, so it was not easy for us to find like-minded friends. She was the one and only youth MENSA member in our city. Even though we participated in local homeschool co-ops and field trips, I found that she still needed to be connected to PG kids like her,” said Gwinup. Wired homeschooling families now have access to vast learning resources, and can transcend geographic limitations to network with other kids and families around the world. They can also access online course, subject-matter experts, tutors, language exchange sites, and free online lesson services, like Khan Academy. Resourceful parents can leverage connectivity to curate a dynamic curriculum that fits a child’s unique interests, abilities, and learning style, a level of differentiated instruction which would be hard to duplicate in a traditional public school. By researching on the web, the Gwinups discovered and joined the Davidson Young Scholar program, a philanthropic initiative designed to support profoundly gifted youth and families. This allowed Elizabeth to connect with other PG kids on discussion forums, participate in seminars, and access targeted learning resources. Through the program, the Gwinups were able to consult experts in diverse fields, and also share experiences with other families who were raising profoundly gifted children. When Elizabeth became curious about Minecraft and coding, Gwinup wanted to be encouraging, but also recognized her own limitations in those areas. “Like any other parents, we wanted to support our child’s interest. 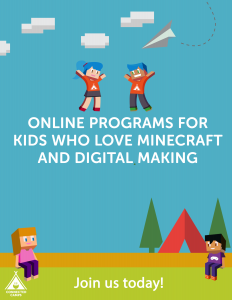 Last summer, her cousin introduced her to Minecraft, and we were trying to find proper opportunities for her to explore and pursue her interest. I tried to do Scratch with her using Scratch workbooks at home, but I realized it would take experts to help,” said Gwinup. A consultant at Davidson Young Scholar recommended Connected Camps, which Elizabeth joined and participated in a number of Summer Camps and Afterschool Lab programs to explore her newfound passions for building and coding. “It has been great for her to learn and share her thoughts and ideas with campers, and professional and friendly moderators. Participating at the camps gave her further opportunities to experience group work with different age groups,” said Gwinup. As Elizabeth’s proficiency grew, the family thought she would benefit from one-to-one mentoring. She was paired with Luke Lohden, who had been her counselor in the Scratch coding camp. To optimize the personalized learning experience, Lohden reached out to Elizabeth’s parents to work out how to tailor the program to her specific needs. Under his tutelage, she explored engineering with redstone, game design, programming in Scratch, and programming in Minecraft. Lohden’s ability to work with Elizabeth in a dedicated manner highlights one of the great benefits of homeschooling children in the digital age. No longer bound to the kitchen table, parents can reach out across the ether to assemble a virtual faculty for their child. And, despite the distance, kids can still enjoy the nurturing and personalized support that characterizes the best teachers-student relationships. It quickly became apparent to Lohden that Elizabeth had a passion for storytelling, so he helped her direct her coding projects to nourish her narrative interests. “When coding programs for turtles, they couldn’t simply be coded to complete a task alone. They existed in a context. Together, over the course of multiple sessions, we built a ‘Turtle Town’ and every turtle denizen had a role and a personality,” said Lohden. The specialized attention received by Elizabeth from her online mentor leveraged her passions and interests to help her learn new skills. While teaching their daughter at home, the Gwinups can transcend their own instructional capacity to provide a rich, varied, and highly individualized education for their child. “Honestly, I can’t tell how much she has learned because neither my husband nor I can follow all of the things she can do anymore,” said Gwinup. Photo courtesy jimmihomeschoolmom on flickr.